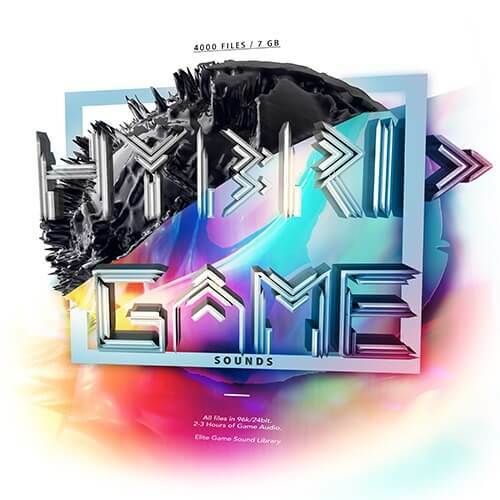 Forge your next audio experience from the alloys of Hybrid Game Sounds, the latest greatest and most advanced crossbred collection from Epic Stock Media. Hybrid Game Sounds conveys a studio brewed cutting edge audio asset collection with more than 4400 sound files: over 2000 source and organic audio assets, over 2200 synthetics and designer sounds, plus 20 high fidelity music loops as a bonus to help you add a finishing touch to your project. Hybrid Game Sounds has been produced and curated specifically for game producers and sound designers, no doubt about that… at the same time this molten mix of audio alloys is a certain source of inspiration and excitement in any audio for video and motion graphics production and anywhere action, movement and gameplay are setting the scene. This massive conglomerate of multifarious sound delivers dark overtones and shimmering stars scintillating sweeps and sci-fi tech, game play groupings for specials, locks and unlocks, achievements, objectives and even weapon textures. Check out the demos to get some inspiration for your own custom audio creations using Epic Sounds and Effects Hybrid Game Sounds collection. All sound files are 96k/24bit resolution for the most discriminating audiophile listening experience and making this collection instantly ready for console and PC gaming platforms. To speed your production and save you time, the complete set of pre-converted files in 44.1/16bit are included with every purchase making this collection easier than ever to blend and infuse into your epic production.